A fascinating discovery at the Menkaura megalithic temple(MT), sheds a new light on the amazing technical, mathematical and geometrical knowledge the Ancient Egyptians possessed. Many theories exist on the geometrical patterns of the Giza Plateau often in the absence of any relevant evidence, except for tracing arbitrary lines. Our discovery is unique, totally different in the sense that it permits us to discern the starting point for the disposition of the sophisticated monuments on the plateau. And it also reveals the real purpose of an existing construction designed to reproduce at will all the necessary measures with utmost precision. It all started with the discovery made by the Egyptian researcher Sherif El Morsi a member of the Giza for Humanity team, on the Giza Plateau. The reason why, this particular stone structure of the Menkaura megalithic temple (MT) is so important, is that the construction of the Giza pyramids was only possible thanks to complex and precise measurements based, as you will discover, on calculations made from the Menkaura temple (Note: 1). It means that this megalithic structure may actually predate the Giza pyramids allowing the Ancients to calculate the measuring unit of reference needed to build the Giza complex, and to pinpoint the position of the foundation stones as well as the cornerstones of the Great pyramids to precise spots oriented to the 4 points of the compass. You will see that the stellar observatory and the square enclosure wall are part of a measuring mechanism, and that the square compass is actually the mathematical system used for geometry and calculations, which was the true purpose of the Menkaura Temple (MT). Doing that we are also debunking the “mortuary use”concept of the square temples at the feet of the Pyramids at the origin. All the science of the Pyramid Builders is showing us more and more their genius applied to a better Life and a better understanding of the universe. Everyone acknowledges the Giza pyramids are an incredible technical and mathematical feat, requiring tremendous precision. But as we will show in this first report, the knowledge of the Ancient Egyptians runs a lot deeper than the mere mathematical and technical wonders they accomplished. We will explain in this first text why this temple is of critical importance, and how it allowed the Ancients to build the Giza pyramids with fantastic precision. 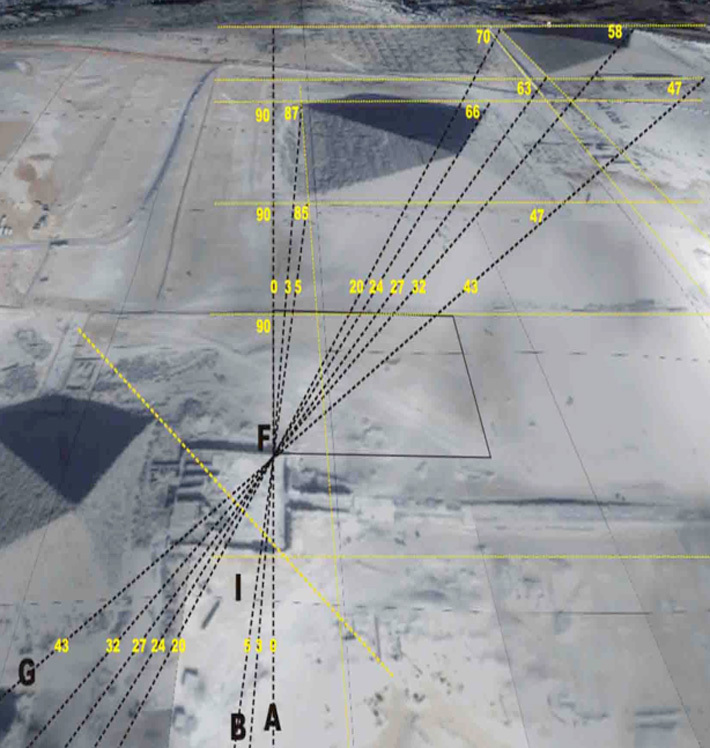 To start with, we have to understand that the Giza complex was built with laser precision only possible with the use of precision measuring equipment as currently used in our advanced technologies. In order to attain such precision of measurement, the calibration of a measuring unit to a perfect constant is necessary. Precision measurements were of greatest importance to the Pyramid Builders. They definitely put much time and effort to calibrate a standard unit of measurement for both distance and angular degrees as you will see in this report. Currently the Great Pyramid is the most precisely aligned ancient structure ever built,its deviation error from the 4 major coordinates is only of 3.5/60 of a degree or 3.5 arc minutes, and that deviation error may be just due to the earth’s 1/60 degree shift on its axial spin every 17,000 years. In order to calibrate the measuring unit and create a reference point on the ground, the Ancient Egyptians built a stellar observatory (the MT) that would magnify the star large enough to measure its accurate movements. 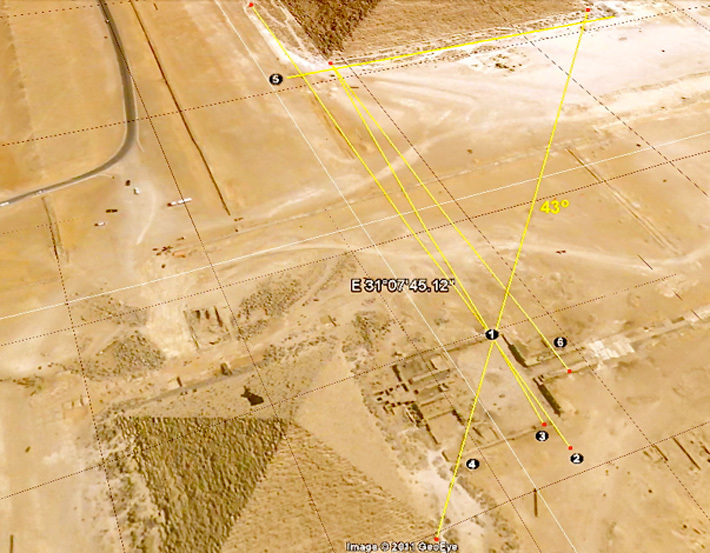 1- Northern Aperture opening on the North enclosure wall,.crossing point were all chords and measurements will intersect as they transpond into the Great Pyramid plateau. 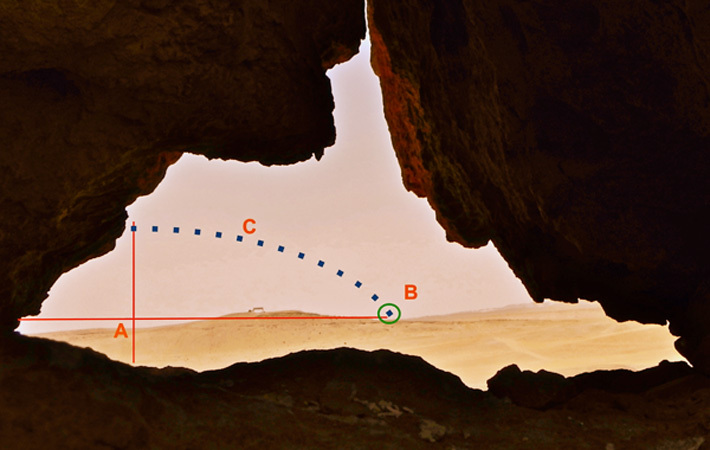 2- as a chord is passed through the 180 azimuth true South and crossing the North aperture, a line is created directing precisely to the North and South Cardinal points marking the excavation of the Khafra slope which becomes the Khafra enclosure with its cliff walls. 3- by passing a chord from the Southern aperture opening at 185 degree azimuth true south and crossing the North Aperture, the Builders mark their first cornerstone which is the Khafra South West corner. 4- by putting the chord on the 43 gradient marker on the Southern wall enclosure and stretching the chord through the North aperture crossing point, the builders were able to mark the South East corners of both Khafra and Khufu. 5- a chord was stretched perpendicular to the North South line which is number 2 in the illustration, intersecting the chords that are marking the cornerstones creating angles that correspond and mirror the angles read in the enclosure compass MT. 6- markers are found all over the plateau as reference points for checking measurement accuracies such as the one illustrated that cuts through western face of the Khafra pyramid. This observatory recently discovered by Sherif el Morsi, actually corresponds to the megalith walls of the Menkaura temple. 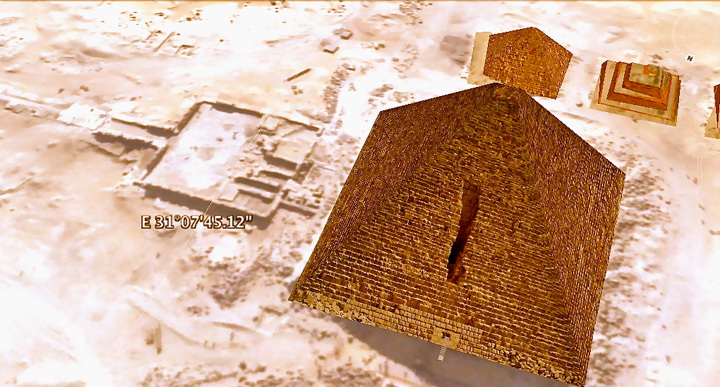 The enclosure of the temple is approximately 50 meter wide, surrounding a flat and paved court yard with the Menkaura pyramid adjoined at its western face. The courtyard splits the Northern temple wall from the Southern temple wall, both walls having their longitudinal sides facing the southern polar coordinate in accurate precision. On each wall, as recently discovered, is a hole opening between two fitted temple blocks. These two holes openings, one on the Northern wall and the other on the Southern wall, are adjacent and parallel to each other. Both holes openings are facing each other and stand at the same elevation circa 72 meters over the sea level. 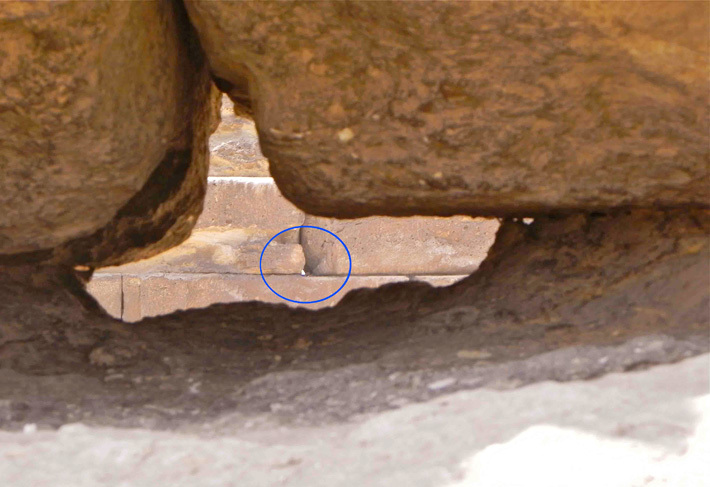 If you peer through the Northern wall hole opening you will view centered in the aperture the Southern hole opening, which is 50 meters distant on the adjacent temple wall, as shown in the picture below. Peeking through the northern hole opening, we can see the southern hole opening 47,25 meters distant from one another. This is the observatory eyepiece and the matrix point. 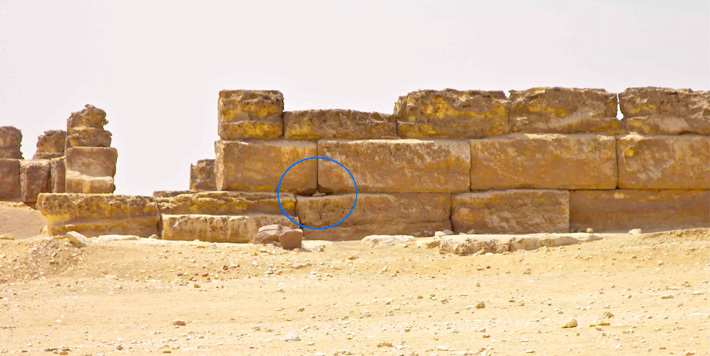 The South aperture hole 47,25meters away on the Southern wall enclosure is seen centered exactly in the North aperture view opening. 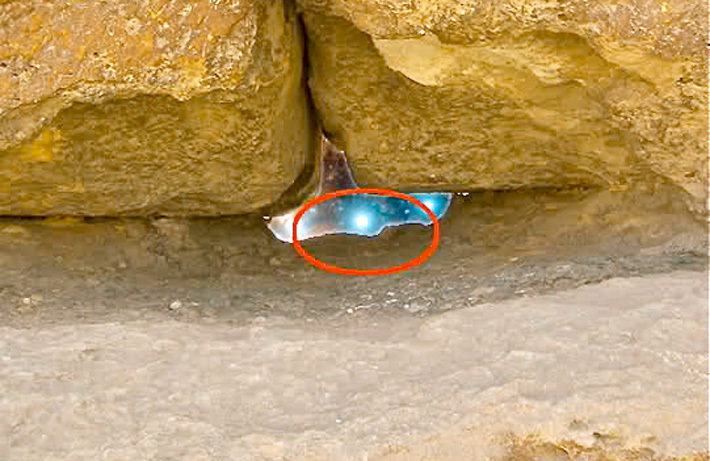 Many have stared and pondered upon this hole, but none have realized that this aperture was perpendicular and at the same elevation as another similar aperture on the parallel southern megalithic enclosure wall 47,25 meters away. Two apertures with a focal length between used for magnification alike in a classic design for telescope.The two apertures are perpendicular creating a line directed 3 degrees over the 185 azimuth. From these two apertures, the Pyramid Builders were able to calibrate a 5degree angle which measures to a 5.25 calibrated meter unit on planar ground. The Northeast corner inside the square megalithic enclosure of the Menkaura Temple with the Northern aperture eyepiece (behind is the Khafre Pyramid,) seen from the South megalithic wall. 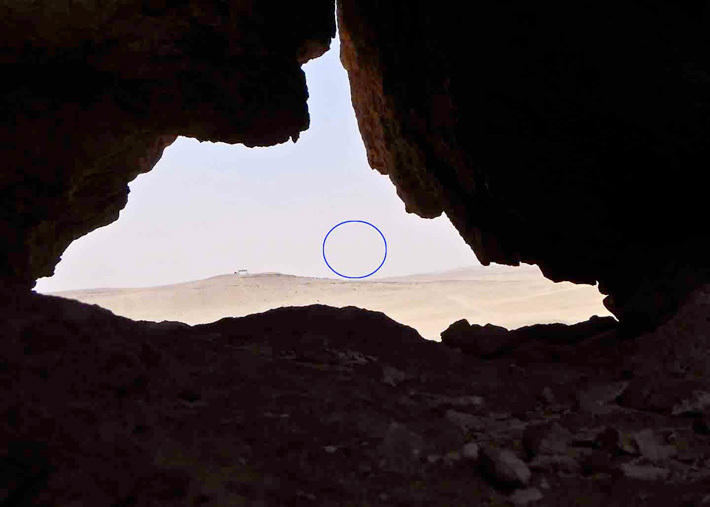 The Northern aperture is linking the square quadrant of the Menkaure observatory with the Northeast Square quadrant of the 2 Great pyramids plateau as seen in photo N°12 . It becomes the South western quadrant of a square compass and a matrix point where all lines are crossing. The Northern Megalithic enclosure wall of the Menkaura Temple at it’s Eastern corner. The North aperture opening can be seen as an eyepiece of an observation post. It is directed to the 180 to 185 azimuth for recording and calibrating the 5° angle between South coordinate and the reference star axis point 3° over the horizon. The ancients Egyptians would stare up to the night sky and observe the apparent circular motion of stars around the celestial pole axis. Northern stars and especially circumpolar ones were visible while most southern ones were under the southern Horizon. Other stars would be seen rising and setting on the horizon. For this reason the Pyramid Builders chose a reference star which sets on the Southern horizon, to orient their future megalith structures with perfect alignement precision to the South. The motions of this reference star in terms of azimuth and altitude will be used to calibrate standard measuring units that will be used by architects for dimensions, elevations, and angular degrees. A view from the Southern Aperture hole found on the Southern megalithic enclosure wall of the Menkaura Temple. The two mounds (in the Southern desert both hilltops are reduced by the sand covering them today.) in front vieware circa 3° over the Horizon on the 185 azimuth. A possible stellar observation of a reference star as it sets on the Southern Horizon. The reference star as it could be seen with High magnification at 3 degrees over the South Horizon . The Southern aperture opening on the Southern MT enclosure wall, directed at at 185 degree azimuth South. An objective tracking the reference star as it sets on 3 degrees over the Horizon. A) True South 180 degree azimuth B) the reference star at 185 azimuth South and 3 degrees over the Sothern Horizon C) The reference star motion in the sky as it rises and sets on the Horizon and revolving over true South. The reference star, a star which stay close to the southern horizon during its nocturnal motion as Alnilam (Epsilon Orionis), has been chosen as the reference star to calibrate both distance and angles. As the reference star rose and set on the southern horizon, the pyramid builders would mark the rising point and the setting point of the reference star. From this rising and setting points on the southern horizon, they were able to measure the midpoint, being the halfway mark between the rising and setting marks. This would then be the radius of the line, giving them their first calibrated measure that is to become a megalith cubit of 5.25 meters corresponding to a 5 degree arc on a compass. By computing the midpoint of the reference star’s (as Alnilam's ) azimuthal excursion on the horizon, the ancient architects had now a precise reference marker defining the true South. This precise astronomic and geodesic work can explain by itself how all the northern and southern faces of the megalith structures on the Giza Plateau were perfectly oriented along the North-South axis. To precisely measure Alnilam's azimuthal motion on the southern horizon and compute accurately its midpoint, the true South, pyramid's builders built a first layer of megalith blocks parallel to the Southern Horizon into a wall where the rising, setting, and the midpoint of the reference star (Alnilam) azimuthal motion were marked upon. A=The South polar coordinate, 180 azimuth, 90 degree axis point calbrated by getting the midpoint between E and B.
B=Southern aperture opening,axis point of the setting reference star 3 degrees over the Horizon,185 azimuth. C= The 5.25 meter calibrated measuring unit, the moving radius of the reference star at 3 degrees over the Horizon and 5 degrees West of the 180 azimuth. D=The calibrated block of stone that all other measures are standardised from whose corners mark the perfect South and the Southern aperture, its lenght is the (.25 meter measuring standard unit, it marks the reference star circumference track from its position at 180 azimuth in the sky until it descends on 185 azimuth, 3 degree over the horizon. E=The rising point on the Southern Horizon of the reference star at 175 azimuth. H= Focal lenght, 47.25 meter wide courtyard. The 5.25 meter distance corresponding to the 5 degrees Alnilam's excursion around the South and the South itself were marked by placing a 5.25 meter long 2nd layer megalith block between the two points, with each of it’s bottom stone corners fitting exactly on the two marker points. The South was marked by the eastern open face of the block, and on the western face of the block was attached another 2nd layer block whith in between them an aperture opening made to observe the exact position of the reference star as it sets 3 degrees over the Southern horizon. Looking through the Northern opening at the the Southern enclosure wall with the Southern hole in view. A- The true South 180 azimuth and the midpoint between the rising and setting of the reference star on the Southern horizon. B- Southern opening at 185 degree azimuth, the reference star viewed through the opening as star reach 3 degrees over the Southern Horizon. D- reference star motion in the sky as it sets toward the 185 degree azimuth South at 3 degrees over the Horizon. This megalith block is to become the « Golden Cornerstone », the physical calibrated standard for all measurements. Its corners precisely marking the South , the marker point of the reference star, 3 degrees over the southern Horizon, and the circumvolution track of the reference star from the 180 azimuth top Eastern corner to its descent on the 185 azimuth at the Southern bottom corner. The 5.25 meter length of the Golden Cornerstone is the calibrated standard linear measuring unit that will be applied to all the dimensions of the megalith edifices on the Great Pyramids plateau. This 5.25 meter calibrated megalith cubit corresponds to 5 degrees on the gradient or one thothic minute as we shall come to discover. Another megalith wall was built parallel and North of the megalith wall facing the Southern Horizon, the distance between them being 47.25 meters or nine 5 degree calibrated measuring units (9 thothic minutes). The Northern Wall was built three megalith layers high, and a second aperture opening was opened on it’s eastern side perpendicular to the South. The Northern aperture opening was to become an eyepiece to observe the South and the setting reference star as it descends in to the southern aperture opening at 3 degrees over the Horizon. A scope was built into the Northern aperture eyepiece as two mounds, in which the reference star would descend between, marking the moment for precision reading. The length between the North aperture eyepiece and the Southern aperture on the Horizon becomes a 47.5 meter wide courtyard between two megalith walls. A Stellar observatory with all the characteristic of a fixed telescope pointing at the 185 azimuth at 3 degrees over the Horizon. This clearly means that the Pyramid builders had the know-how of using lens for magnification (Note 2), and these lens were possibly placed on the two wall apertures, one an eyepiece and the other the objective directed to the Horizon, and a focal length between these two apertures just as used today on the Hubble Telescope for magnification. The magnification was needed for precision measurement to the seconds. Obviously these lenses can’t be see nowadays since all that is observed on the Giza plateau today are the remains of a very ancient sophisticated stellar mechanism. A= The South polar coordinate, 180 azimuth, 90 degree axis point calbrated by getting the midpoint between E and B.
B= Southern aperture opening,axis point of the setting reference star 3 degrees over the Horizon,185 azimuth. G= 43 degree inclined line passing matrix point and crossing the position of the Northeast corners of the two Great Pyramids. These two parallel megalith walls are separated by a courtyard creating a square enclosure that is found in front of the Menkaura Pyramid and is known as the Menkaura Temple. The enclosure walls were not only a fixed Stellar Observatory directed to the 185 azimuth and 3 degrees over the horizon, but a square compass built in dimensions by the calibrated 5 degree measurement that was transposed from the two points marked from the Skies; the South which is the 180 azimuth, and the reference stars setting on the 185 azimuth at 3 degrees over the Southern Horizon. The length of the megalith walls and the distance between them as measured on-site is 47.25 meters, making a perfect square. When we take the 47.25 meters and divide them by 5.25 meters calibrated standard measure we then get 9 units. Since the 5.25 meter length equates to 5 degrees, then 9 units of 5 degrees make us a 45 degree linear gradient. So the megalith enclosure wall dimensions were built by the 5.25 meter calibrated standard measure forming a quadrant of 45 degrees on each face. So the stellar observatory marked the exact position of the reference star on the Horizon so as to calibrate a standard unit of 5.25 meters with a second exactness from the South. This standard measuring unit was used in constructing the dimensions of the enclosure walls into 47.25 meter length, equating to 45 linear degrees or 9 gradient units of 5 degrees, making the Menkaura enclosure walls a square quadrant. The Menkaura enclosure working as a square sextant compass, used for stretching the rope so as to place the cornerstones precisely in position. The Pyramid builders were now ready to stretch the ropes (Note 3) using the Southern megalith wall as the 45 degree linear gradient marker, divided by 9 units of 5 degrees; and the North aperture opening and eyepiece on the Northeast quadrant corner as the matrix point were all ropes would intersect mirroring their gradient degree marker read on the Southern wall into the parallel site which would be the Great Pyramid plateau. By stretching the rope from the Southern wall gradient through the Northeast corner aperture into the Great Pyramids construction site, the movement of the rope on the 45 linear gradient was given the builders the exact angles to fit the cornerstones of the two great Pyramids on the parallel Northeast quadrant which is the two great Pyramid plateau site. At the highest elevation of the Great Pyramids plateau and at it’s Southwest corner, the Ancient Egyptians built a perfect square enclosure. This megalith enclosure was to work as a square compass sextant, in which all angular degree measurements read on the Southern wall gradient intersect at the Northeast corner eyepiece,transposing the measurements like a mirror into the opposite parallel Northeast quadrant which is the Great Pyramid plateau. The first rope to be stretched would be the rope from the South, which is the open Southeast corner of the quadrant enclosure compass (the square enclosure), stretching through the perpendicular eyepiece aperture on the Northeast corner of the Square enclosure compass. This first rope was directed perfectly to the North and South and slicing into the Khafra slope, making the first linear measurement used for the cutting of the Khafra enclosure cliff walls. This perpendicular line directed to the South and North was now the Western face of the Great Pyramid Plateau and precisely parallel to the West-East axis. The Great Pyramid builders had oriented their geometric plane precisely to the four cardinal points; the Southern enclosure wall facing parallel to the South, and the perpendicular line crossing through the South and the North Aperture eyepiece cutting through the cliff walls of the Khafra enclosure, was precisely facing the West-East axis and horizon. At the South which is the quadrant's Southeast open corner and 180 azimuth, the perpendicular rope passing through it and into the North Aperture eyepiece has created the first calibrated right angle of 90 degrees; this was to be the base standard right angular calibration used by the Pyramid Builders for right angular and square measurements and used extensively in the construction of the megalithic structures on the Giza Plateau. By connecting the three calibrated axis, South aperture, North aperture (eyepiece), and the south , the Giza Builders had created their Golden triangle. A 90 degree angle at the South, a 5 degree angle at the North aperture, and an 85 degree angle at the Southern aperture. By stretching a rope from the South aperture intersecting through the Northern aperture, the Builders obtained their first precise measurement (of 5 °) in positioning the first Great Pyramid cornerstone which is Khafra’s Southwest corner. Through putting the rope on the 43 degree gradient marker of the Southern enclosure wall, the builders stretched the rope through the Northeast aperture eyepiece and through the Great Pyramid plateau to mark and position the two Northeast cornerstones of the two Great Pyramids. All the 8 corners of the two great Pyramids were fitted and positioned to precision by a rope that was stretched through the Northeast aperture of the Menkaura square compass enclosure whose axis was constant as the rope was being moved up and down the linear gradient markers on the South enclosure wall. Where ever the rope was placed on the Southern enclosure wall, its gradient Reading from 0 to 45 degrees would also be the angle Reading at the North aperture eyepiece. As a rope was stretched from the Southern wall gradient through the North aperture eyepiece and then crossing into the Great Pyramids plateau, marking the Great Pyramids cornerstones position and orientation, another rope was stretched perpendicular to the Western horizon which is the line intersecting the south and the North aperture eyepiece, stretching till both ropes intersect on the great Pyramid Plateau. Through this intersection, the builders had to make sure that the angles of the intersection and the North aperture eyepiece were equal to the angles read in the enclosure Quadrant, creating right triangular measurements with their left corner being always the 90 degree angle that crosses with the Western Horizon line. 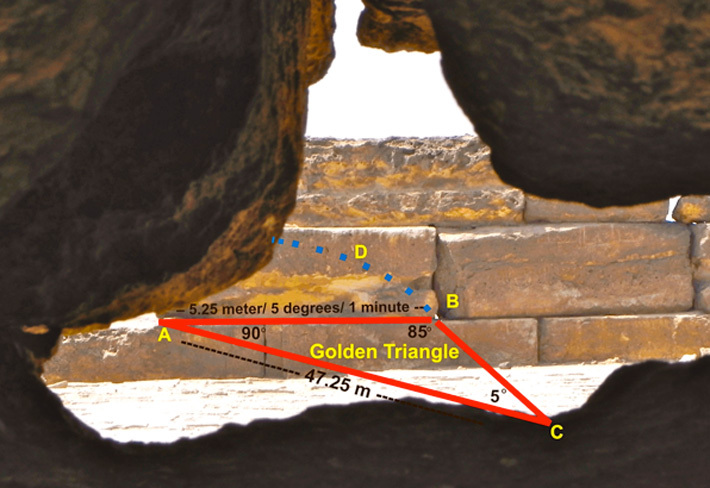 All angles from the rope intersections read on the plateau were mirror readings of the angles read in the enclosure Quadrant, as the chord shifted on the ( 45° )Southern gradient wall. From a reference star close to the South horizon, the Giza Builders were able to find the precise South by getting the midpoint between the rise and setting points of a reference star on the Horizon. To get precise calibration to a minute detail, an Observatory was built to magnify the reference stars’s descent on the Horizon, into a scope made out of two mounds in the observatory eyepiece. From these two calibrated axis, the South and the reference star’s point on the setting Horizon, the Pyramid Builders were now ready to build a square compass working as a sextant for the angular measurements needed for the precise orientation of the Great Pyramids and the precise placing of the Great Pyramids cornerstones. This Stellar Observatory was built into the precisely squared enclosure walls, which is currently known as the Menkaura Temple. As the rise and setting points of the circumvolving reference star were marked by the Builders onto the Southern enclosure wall blocks, which are precisely parallel to the Southern horizon, an aperture was opened in the North enclosure wall so as to create a matrix point and an eyepiece so as to measure the angular distance of the reference star on the Horizon from the polar axis. The Northern aperture in the Northern wall was now made to work as a sextant, measuring the calibrated distance in degrees between the two coordinates. The reference point of the star setting at 3 degrees over the Horizon is an exact 5 degrees azimuthal west shift from the polar axis. This is the Giza Builders first calibrated distance which is 5 degrees between the two points; 1) the south being the mid point between the rise and setting of the reference star on the Horizon which is the 180 degree azimuth, and 2) the reference point of the reference star setting on the Horizon being at 185 degree azimuth. The Giza Builders have now a constant calibrated unit of 5 degrees, and a perfect orientation to the south. From this calibrated measuring unit of 5 degrees between the two points, the Giza Builders were ready to size the enclosure walls into a 360-degree compass made out of 4 quadrants. The Builders did not measure the skies by a 360-degree circle, but by a 360-degree square with each face equaling 90 degrees and pointing to one of the 4 cardinal points. We called it in honour of Thot : The Thotic square compass. A 360 degree square with 72 minutes compared to our current 360-degree circle with 60 minutes, and working like a stellar grid.Each face facing toward a main coordinate being the midpoint dividing the 90 degree face into two 45 degree sides, and making 4 square quadrants in the square. The 360 degree square is divided by 72 minutes each minute when divided by 10 seconds gives us the Royal Cubit lenghth of 52.5 centimeters. The length of each face was the 5 degree calibrated unit measure multiplied by 18, giving us a 90 degree length with each cardinal point as its midpoint. So the four faces of the square compass where directed and facing the 4 cardinal points, NSEW, with each of them being the midpoints of the face. By closing the four 90 degree faces together the Builders had a 360-degree square. Each 90-degree face was divided by the coordinated midpoint making two 45 degree sides on each side of the coordinate, therefore, the Square Compass was also made up of four quadrants or eight 45 degree sides. The Giza Builders calibrated a perfect 360 degree square from two calibrated points on the Horizon, when divided by the calibrated measuring unit of 5 we then get 72 minutes. Incredible as it seems but we have discovered the Thothic measuring unit, a 72 minute division from a 360 degree Square. The PERFECT SQUARE WORKING AS A 360° STELLAR COMPASS. 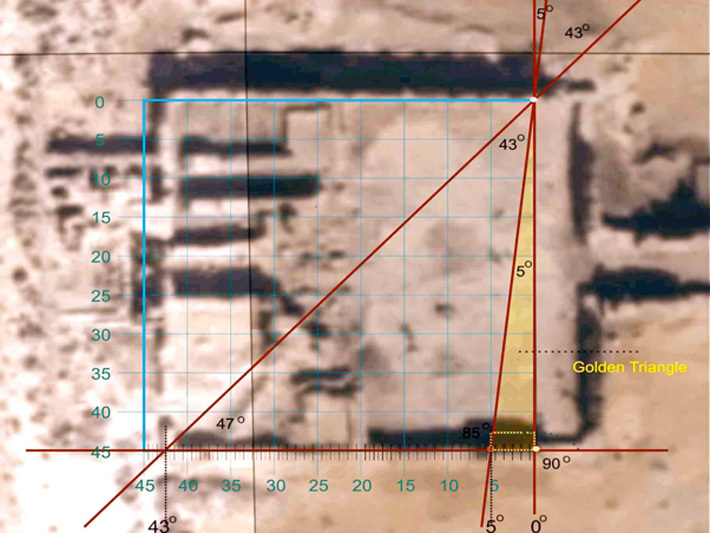 The Giza Builders copied the South West Quadrant of the Square Compass into the construction of the enclosure walls of the Menkaura temple, all measured by the calibrated 5 degree measuring unit, which is one Thothic minute. 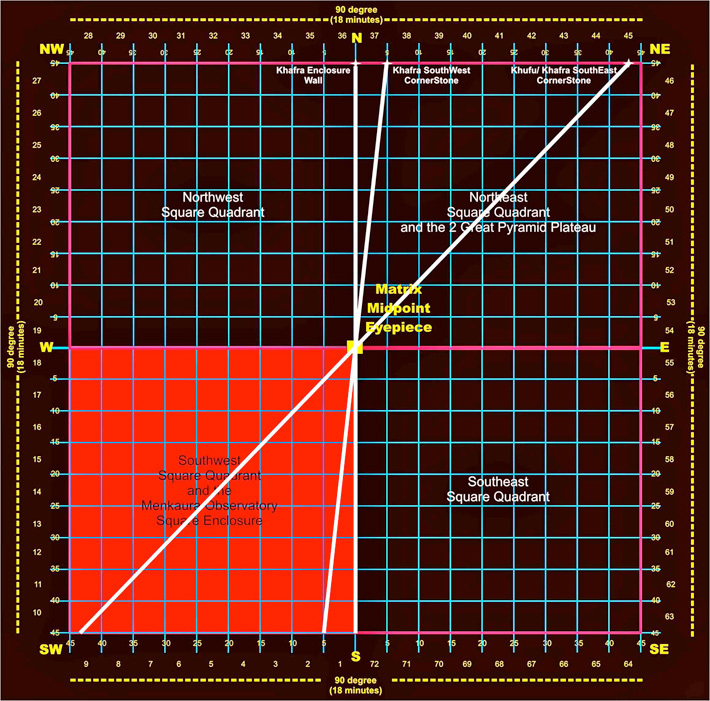 The Northern aperture wall opening, which is also the Observatory eyepiece and the Northeast corner of the Southwest square quadrant, was also the matrix point where all the degrees and minutes of the quadrants will intersect, also being the center point of the Square Compass. This Northeast corner will now work as a sextant with all the calibrated degrees and Thothic minutes (Note 4) of the Southwest Square Quadrant intersecting this matrix point and transposing their angular measurements into the parallel Northeast quadrant, which is the Great Pyramids plateau. An incredible feat of precise measurements transposed from two points on the horizon, creating a perfect Square with 90 degree sides all facing precisely to the 4 coordinates making a 360 degree enclosure that was divided by a 5 degree calibrated unit making 72 Thothic minutes as axis references. This is the very ancient square compass used by the Giza Builders and used as a sextant to grid the plateau to perfection. From the above, we have now made another discovery. We will now take the 5 degree distance between the South and reference star on the Horizon, and find out the calibrated distance in our current metric system. Since the enclosure walls make a perfect Square, and we know from on-site measurements that the Southwest quadrant face is 47.25 meters length due to the 47.25 meter wide courtyard and focal length. We will now take the 47.25 meters and divide it by the 9 minutes of the 45 degree long quadrant face to get 5.25 meters . This 5.25 meter calibrated metric unit was to become a standard unit of measurement and is the multiple 10 of the ancient Egyptian Royal cubit of 52.5 centimeters. So we have now discovered that the ancient royal cubit of 52.5 centimeters was derived from one tenth of a Thothic minute. In other words, the calibrated 5 degrees was 5.25 meters in length, divided by ten Thothic seconds makes 52.5 centimeters. So we have found the Akhet on the Horizon, and we have found the Golden triangle, and the Golden Cornerstone, and now the Thothic Square Compass in which is derived the 72 Thothic minutes which when divided by ten seconds makes the Royal cubit of 52.5 centimeters. If today we had to build the Great Pyramids with a 360 -degree circular compass would the outcome be as precise as a Thothic Square compass? We explained the Stellar Observatory, the Square Compass Enclosure Walls, and the extraction from on-site measurements that have formulated the schematic representation of the Square Compass with a precision of 72 minutes and 720 seconds. The following calculations are for more clarification . We will take our current 360-degree circular compass and extract from it the embedded Thothic minute. We have 3 axis points in the temple walls enclosure calibrated and extracted from the motion of a reference star’s position over the horizon, which are the North aperture, the South aperture, and the polar axis. The focal distance between the Northern aperture to the perpendicular south polar axis is 47.25 meters. The distance between the South and the South aperture axis is 5 degrees distance, the South polar axis being 180 azimuth and the South aperture being on the 185 azimuth. Since we know that there are 45 degrees in the quadrant face we will then take the 45 degrees and divide it by the calibrated 5 degrees to get 9 Thothic minutes. Therefore a thothic minute equals 5 degrees. The focal length between the Northern aperture and the South is 47.25 meters, which is the metric length of a 45 degree quadrant face. So we will take 47.25 meters focal length and divide it by 9 Thothic minutes giving us 5.25 meters, which when divided by 10 seconds gives us the Ancient Egyptian Royal cubit standard measure of 52.5 centimeters. Therefore, the ancient royal cubit of 52.5 centimeters is a Thothic second from the square Compass. So lets take a look at our current 360-degree circular compass and go over these calculations and discover that the Thothic Square Compass is embedded in our current mathematical system. We will take the latitude and longitude planar coordinates of the three calibrated Observatory axis's and find the distance between each axis using our current minute and second compass measurements. When we calculate the distance between the South aperture axis and the South we get a degree measurement of 0.16 minutes, which corresponds to the 5 degree calibrated measure. We will now calculate length between the North aperture and the South to get 1.44 minutes, which is the length of the 45 degree Quadrant face. Now, by taking the 45 degree 47.25 meter long quadrant face of 1.44 minutes and divide it by the calibrated 0.16 minutes we get the sum of 9 Thothic minutes. This summation proves that this discovery, it's observation, and reconstruction is 100 percent correct. And to add some salt, if we take the 47.25 meter long focal length and quadrant face and divide it by 90 Thothic seconds then we get 52.5 centimeters which is the ancient Egyptian Royal Cubit. This first report is only a short overview of our latest discoveries and we are in the process of making further in-situ measurements. So many discoveries have been made with many other major implications that we are currently going further in a subsequent work and writing a book about them. Thanks to this discovery we might be on the brink of understanding how the minds of the Ancient Egyptians worked and how they conceptualized their reality. We would like to thank Philippe Alexandre Gaugain for his help with scientific corrections ; Shirley Longacre for her contribution on the English ; formulation ; Antoine André for the English correction ; all the Giza for Humanity team for their support . We would also like to thank the Egyptian officials for their work and préservation of the Giza plateau site. 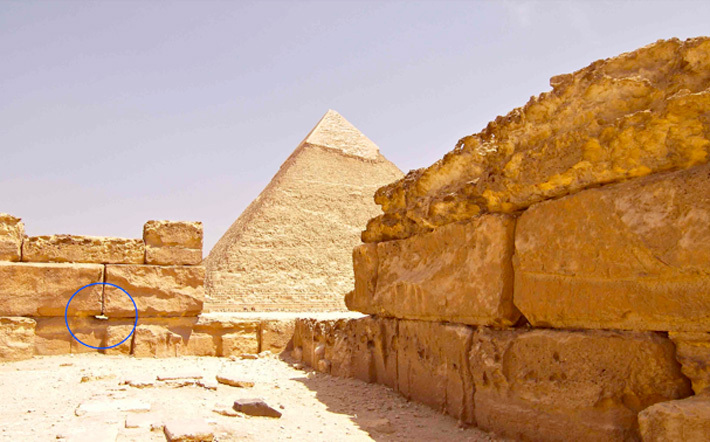 In the temple at the feet of the Menkaura Pyramid, the inner core was made of limestone. Reisner estimated that some of the blocks of local stone in the walls of the temple weighed as much as 220 tons, while the heaviest granite ashlars imported from Aswan weighed more than 30 tons. For us, it is a megalithic temple ( There are megalithic monuments throughout the world predating Neolithic and revealing evidence from Mesolithic), with further additions by later different pharaohs as under Menkaure and Shepseskaf and also during the Saïte period ( it was not unusual during an enlargment work or restoration work in Ancient Egypt to affix the seals of the pharaoh who ordered it). « The King stretches the rope in joy. » Sentence on a Denderah temple wall. « The "Stretching of the Rope" foundation ceremony in which the astronomical alignments were fixed is well documented for the orientation of temples and it is actually already present in the old kingdom stela called "Palermo stone" (J.A. 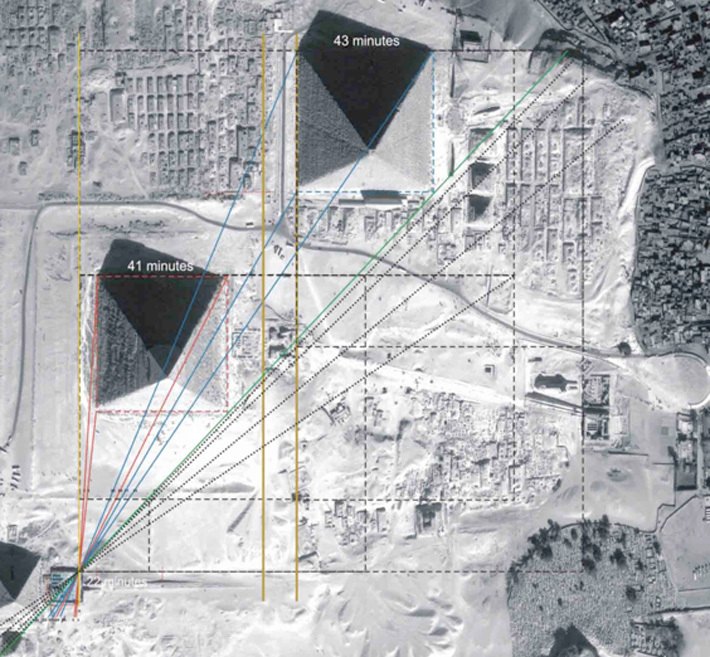 Belmonte, On the orientation of old kingdom egyptian pyramids, Archeoastronomy 26, 2001, .S1. ; quoted by Giulio Magli). This is the earliest notice of a Stretching of the Cord ceremony and it refers to a period earlier than that of Djoser.We do have other texts documenting this ceremony of the « Stretching of the rope» about how the foundations of a temple were done and the temple axis was laid out by stretching a rope between two stakes,poles. 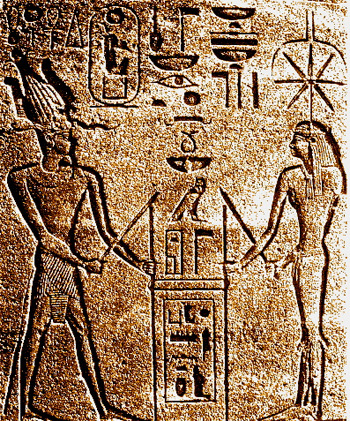 It is frequently depicted, as in the picture below, on temple walls.you can see the pharaoh holding up the two poles with the goddess Seshat the goddess of architecture, astronomy, astrology, building, mathematics, and surveying.with her hieroglyphic sign over her head, to establish the four corners of the temple. The hieroglyphic on the head of Seshat is probably more indicating a system of measurement, angles and distance than an other thing. Also the hieroglyphic on the head of Seshat was different in an earlier time and can depict a device for observing upper culmination as it is suggested by Belmonte. The Egyptians credited Thot as the author of all works of science, religion, philosophy, and magic. The Greeks further declared him the inventor of astronomy, astrology, the science of numbers, mathematics, geometry, land surveying, medicine, botany, theology, civilized government, the alphabet, reading, writing, and oratory. They further claimed he was the true author of every work of every branch of knowledge, human and divine. Thoth was the 'One who Made Calculations Concerning the Heavens, the Stars and the Earth', the 'Reckoner of Times and of Seasons', the one who 'Measured out the Heavens and Planned the Earth'. He was 'He who Balances', the 'God of the Equilibrium' and 'Master of the Balance'. 'The Lord of the Divine Body', 'Scribe of the Company of the Gods', the 'Voice of Ra', he who understood 'all that is hidden under the heavenly vault'. According to the legend, decimal time was invented by the god Thoth in Ancient Egypt.The day was divided into 10 decimal hours. Each decimal hours or 2.4 hours or 2 hours and 24 minutes, contains 100 decimal minutes and each decimal minute or 86.4 seconds, has 100 decimal seconds. But going further we found in our research that the Thotic mn could be = 360°/72= 5°=(Alnilam's rising point's precession in 360 years)= Alnilam's half nocturnal arc of at the epoch of theMenkaura's observatory building. -“L’orientation astronomique dans l’ancienne Egypte et la precession de l’axe du monde” Z.Zaba, Prague 1953. -« On the Orientation of Old Kingdom Egyptian Pyramids » Belmonte, J. A. Journal of History of Astronomy, Archaeoastronomy Supplement, Vol. 32, p.S1. - « On the astronomical orientation of the IV dynasty Egyptian pyramids and the dating of the second Giza pyramid. »Giulio Magli, Dipartimento di Matematica, Politecnico di Milano. --« The Crystal Sun: Rediscovering a Lost Technology of the Ancient World », Robert Temple, Arrow Books: London, 2000. - « Lenses in antiquity » Sines, George; Sakellarakis, Yannis A. (Apr. 1987). American Journal of Archaeology.